Who will take over the farm? 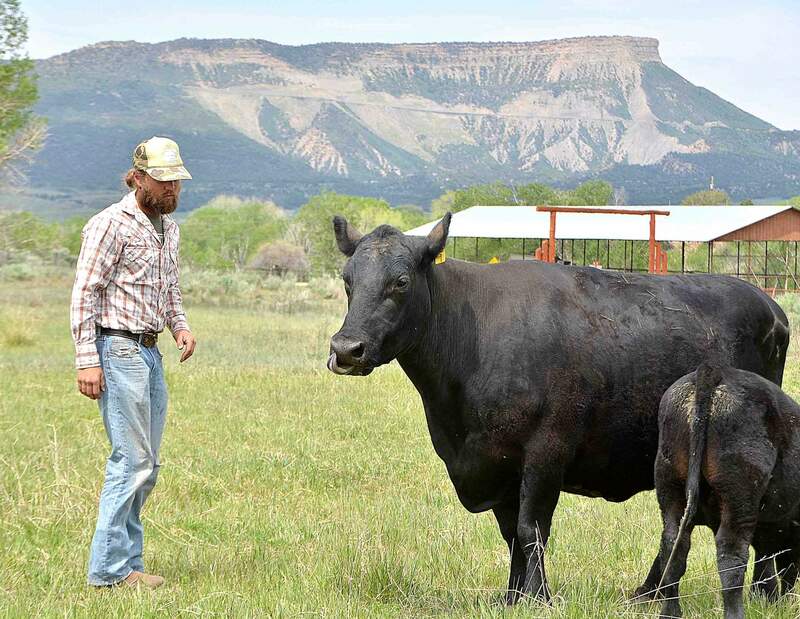 Dustin Stein, 30, manages Stubborn Farm and Burk Beef in the Mancos Valley, where a substantial group of young producers have found a home. Stein is optimistic the valley will be rooted in agriculture for years to come. Jay Daves, left, an incoming high school senior, and is starting his fourth summer farming. This year, he is leasing 488 acres of his own. 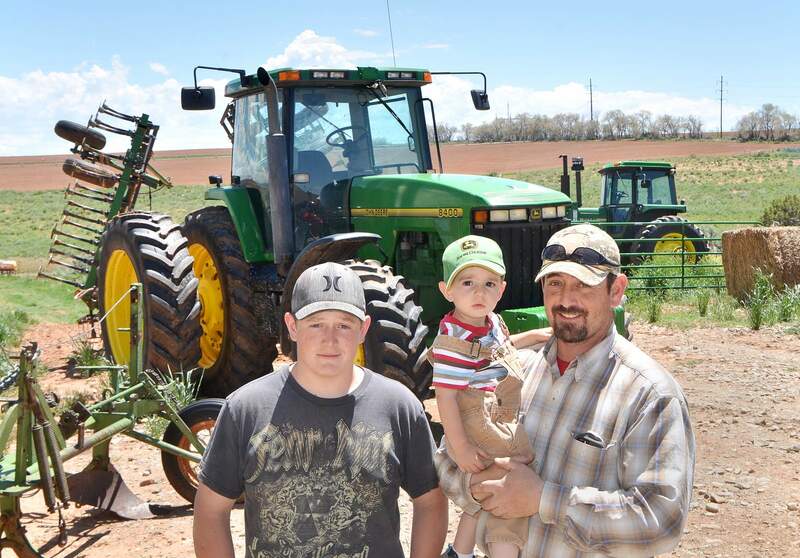 Destry Daves, with his 2-year-old son, Cooper, is the fourth-generation farmer on the Pleasant View-area farm. His sons would be the fifth generation. Dustin Stein, ranch manager for Stubborn Farms and Burk Beef, teamed up with Patricia and Jack Burk who wanted their land to remain in agriculture. Agriculture is facing a long-term math problem. Current farmers and ranchers are aging, more children are walking away from family operations and young entrepreneurs face monumental startup costs. How will agricultural land remain in production? The average age of farmers and ranchers in Montezuma County crept up to 59.5 years in 2012 from 57.6 in 2007, according to recently released agricultural census data. Dolores County saw a similar trend with its current average, 59.6 years of age. The state average hit 58.9 years in 2012, up from 57 years in 2007. Finding new, young operators from the suburbs seems like a fairy tale. But there are nuances the data don’t capture. 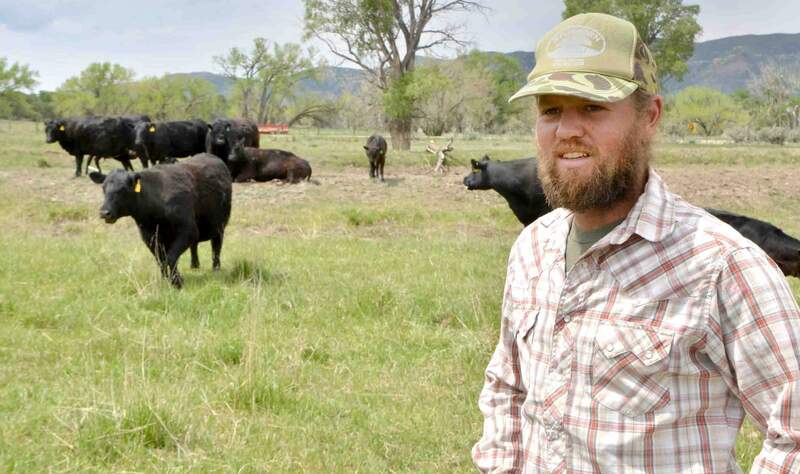 Denver-metro native Dustin Stein, 30, took over management of Stubborn Farm and Burk Beef near Mancos two years ago and plans to be part of the operation long term. Stein fell in love with gardening after moving to Durango for college. After working all day in construction, he would spend his spare time in the garden. So he took a beginning farmers class from the Colorado State University Extension Office and started off by interning and then leasing a small plot of land. The biggest challenge he faced was finding a property with water rights to buy. “I wasn’t confident I was ever going to find that,” he said. Teaming up with Patricia and Jack Burk, who wanted to see their land continue to be used for agriculture, worked. Stein is one of a fairly substantial group of young producers in the Mancos Valley. Much of Colorado’s farm and ranch land is priced for development rather than agricultural use, and this is a problem that is widely recognized. “It’s tremendously expensive and risky,” said Terry Frankhauser, executive vice president of the Colorado Cattlemen’s Association. It takes someone who is driven and committed over a long period of time. The path to a ranch for a fresh entrepreneur is not straightforward and may require an outside source of income. “Cows will never pay for the land they are running on,” Frankhauser said. Children in farming and ranching families can have a natural advantage, and these families may skew the averages a bit. Often, farms and ranches may be held in the patriarch or matriarch’s name, and this has always skewed the average age to the high side, Frankhauser said. This is the case for Destry Daves and his sons, who raise beans, alfalfa and cattle near Road BB in Montezuma County. Daves’ son Jay Daves is an incoming high school senior and will be starting his fourth summer farming. This year, he is leasing 488 acres of his own. “I feel like this is what God wants me to do,” Jay said. The family works together on the entire operation pooling resources to buy equipment and manage the land. Jay’s older brother recently graduated from high school and will be joining the Army, but he plans to return to run the livestock side of operations. It has long been the trend that kids may leave the farm to work for a while and then return. But the trend is for fewer kids to return to the farms. That is a concern for the industry, Frankhauser said. Farmers and ranchers may choose to sell their land to developers to fund their retirement, which leads to urbanization. This is increasingly common on the Front Range. Mancos rancher Larry Everett, 73, chose to place his most productive land into a conservation easement to make sure it would remain in agriculture. By entering into a conservation easement, farmers can make 50 percent of the money they would receive from a developer. The easement also reserves the land for agriculture and thereby reduces the price by taking away its development value. “It actually makes the land more available to other ranchers,” said Everett, a third-generation rancher. To tackle the problem, the Colorado Cattlemen’s Association and Colorado State University are working to help new ranchers through The Colorado Ranching Legacy Program. The program works with young generational ranchers on transferring ranches and the tax burden that can arise if the transfer is done after the landowner’s death. In the worst-case scenarios, ranches have been sold to pay taxes, said Devin Murnin, the program’s director. The program also helps ranchers with sustainable business plans and increasing profitability. However, Stein, who’s in the process of expanding the Burks’ cattle herd and starting a local distribution co-op, is optimistic the area will remain economically rooted in agriculture for decades to come. “It’s in the blood of all people from here and a lot of people that move here,” he said.